Yogi Berra died yesterday (Sept. 22, 2015) at the age of 90. 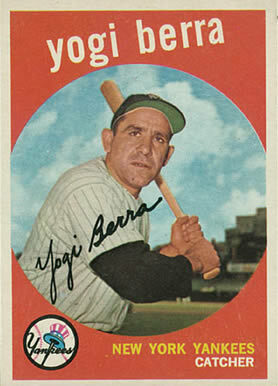 Yogi anchored the greatest dynasty in baseball history. He played on ten world championship teams, won the American League MVP award three times, and was inducted into the Baseball Hall of Fame in 1972. But he is probably most famous for his off-the-field comments. I have a book in my library written by Yogi himself about some of his funniest quotes. So, in his honor and memory, I have written some of my favorites and the situation that prompted them. He said this when someone asked him about quotes that he didn’t think he said. Talking to Stan Musial and Joe Garagiola in 1959 about Ruggeri’s restaurant in his old neighborhood in St. Louis. His comment after Mickey Mantle and Roger Maris hit back-to-back home runs for the umpteenth time. Comment after the 1960 World series between the Yankees and Pirates. It was a seven-game series that ended when Bill Mazeroski hit a home run over his head. Following a dinner at the White House by invitation of President Gerald Ford. Spoken when giving Joe Garagiola directions from New York to his house in Montclair. Comment on his way to the Hall of Fame in Cooperstown in 1972. He got lost. Spoken after his alarm clock didn’t go off. Comment made about playing left field in Yankee Stadium during late autumn. The shadows give you a tough time to see the ball. One of his better coaching tips. Said many times. 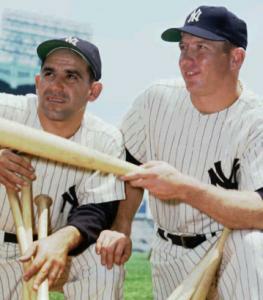 Spoken to Mickey Mantle about all the funerals they attended together one year. Telegram sent to Johnny Bench after he broke his record for most home runs by a catcher. Yelled as manager of the Yankees in 1964 when the players weren’t paying attention to the game. 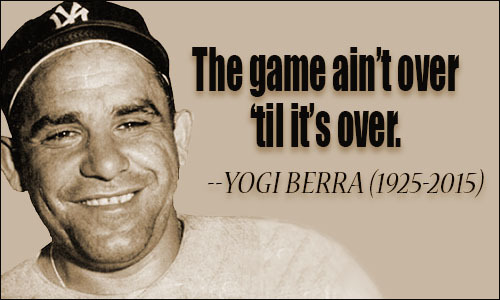 Yogi’s wisdom on goal setting. Slipped out of his mouth when someone asked him about his beautiful wife. His answer to why the New York Mets were 9 games out of first place in July 1973. They went on to win the division. I love Yogi Berra’s look on life. Which one is your favorite?